It was a rainy early evening, the Saturday following America’s unofficial national holiday celebrating the spirits of the agave plant — known in Mexico as Cinco de Mayo, Independence Day, when I found myself in a friend’s kitchen making its official drink from scratch. I was pleasantly, surprisingly, comfortable in my newfound role as novice mixologist, eager to flex my margarita-making muscles after a successful first attempt the weekend prior. Why did it take me so long to attempt something this simple? Squeeze your desired combination of citrus, mix the juice with one part Cointreau and two parts tequila, a little agave for good measure, and shake over ice? Perhaps it’s not so simple. It’s a great question, with a not-so-great answer that can be found somewhere near the intersection of fear of failure and lack of confidence, with a dash of my own brand of bitters: the Virgo perfectionist kind. Turns out my hesitation isn’t so uncommon, and The Liquid Projects’ Jennifer Massolo is diving in head first to do something about it. When Massolo eventually moved to Miami in the early 2000s, the Miami International Wine Fair came calling. She knew she wanted to get out there and do something on her own, and putting this event on, eventually directing it, gave her a great base of knowledge of the industry. She was meeting people that weren’t just in the wine business, but back to her original calling — spirits. “I realized that this craft spirits movement was very appealing to me, the many stories I’d encounter of people making things by hand,” she continued. Manual process, meaning at the most fundamental level, the use of copper pot stills on which you have to physically stop the distillation process by hand. Usually there is a family or national history. Distinctive ingredients in the recipe. 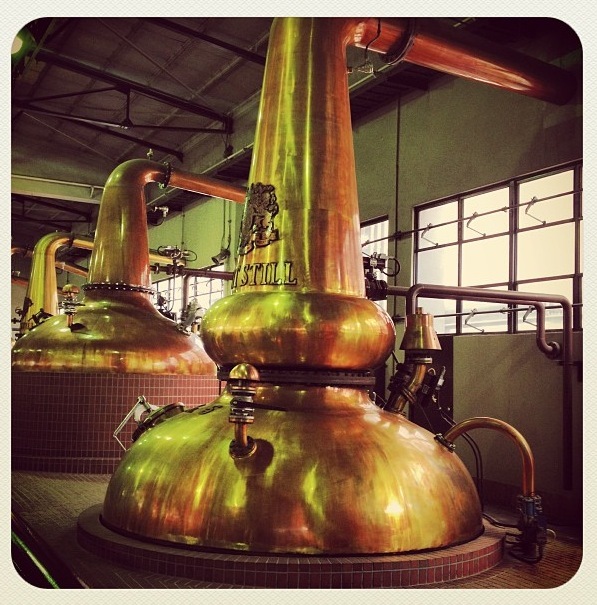 Copper pot stills at Suntori Whiskey’s Yamazaki Distillery, 20 minutes from Kyoto by train. Longtime MGFD customer, whiskey aficionado and friend of Massolo’s Steve Berry and I went on the property’s very thorough and enlightening tour (for the novice and the expert alike!) when we traveled to Japan in April. Spirited Sirens is Massolo’s new series of educational seminars primarily geared towards – but not solely for – women and artisanal imbibing. Copper Pot Stills at Woodford Reserve, Versailles, KY. So that was the way it began, with Massolo taking 2013 by the horns and embarking on an adventure. And journey she did, taking it all in, with plenty of pictures to catalogue the experience — beautifully — as you can see for yourself. And there were plenty of cocktails along the way. Tasting is the only way to develop your palate, learn what you like – and most importantly what you don’t. Like badly-made, sickeningly sweet margaritas. On Monday, we dive in without hesitation again, welcoming Massolo and her Spirited Sirens tasting series to our private dining room at Michael’s Genuine Food & Drink in the Design District. Her two-hour sampling session is dedicated to tequila and mezcal, the roasted, smokier cousin spirit of tequila made from the fermented juices of the agave plant. Amid tasting and talking, just like she and I did in her kitchen, you will have the opportunity to learn about the basic history of the tequila and mezcal making process; how to incorporate them into cocktails; the styles and nuances of both and how to pair them with different dishes. And we hope, get inspired. $35 per person includes a welcome mezcal margarita cocktail, as well as two neat tequilas, two neat mezcals and one closing dessert cocktail, a Paloma with tequila, grapefruit, lime, agave, plus two dishes to share family-style from the genuine kitchen and a treat from Executive Pastry Chef, Hedy Goldsmith. Click here to follow The Liquid Projects, including its Spirited Sirens series and upcoming Craft event in Miami November 8-10. Salute! Every product has to start somewhere, even mass market corporate brands, so I take this to mean that this history both establishes a narrative key to the product’s identity and its brand equity, and with my naivety speaking, protects against the potential tarnishing influences of the market. In effect this indelible link to the past, self-regulates product quality and consistency for its future innovation.